The night out was a change of pace for the superstar, who kicked off her Formation World Tour in Miami on April 27. Just days before the Met Gala, Queen Bey released her second visual album,Lemonade, which includes lyrics about cheating, a broken marriage and giving love a second chance. While Boom Boom Roommaintains a safe berth – 18 stories, that is – from the plebeians, the only insurance for those attending Olivier Rousteing’s post-Met bash at the Gilded Lily on Monday night was a heavily-manned door. 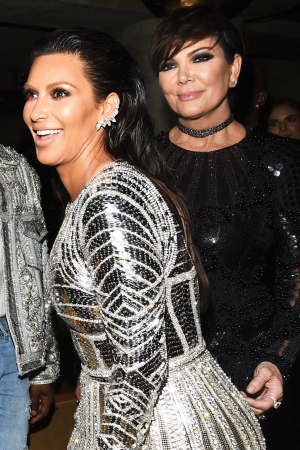 After this year’s rousing Met Gala, which saw The Weeknd take to the stage, Beyoncé arrive in grand “formation” and the (majority) of the Kardashian-Jenner-West clan sat en masse with Olivier Rousteing of Balmain, it was only fitting that the parties were equally dazzling. Kicking off things were Jimmy Iovine, André Balazs, and Sir Jonathan Ive down at the Boom Boom Room. Inside the top of the Standard was a coterie of actresses, including Amy Schumer, Emma Stone, Lupita Nyong’o, and Margot Robbie, who were joined by heavy hitters including Sean Combs, Idris Elba, Harvey Weinstein, and J. J. Abrams. As Johnny Depp and Amber Heard sipped on cocktails, aVuitton-clad Jennifer Connelly enjoyed the ambiance and the ability to let her hair down. And to help get everyone in the spirit was Lady Gaga, who belted out her greatest hits to the glittering crowd. Nearby, Rousteing brought his own sparkling touch to Gilded Lily with his #BalmainArmy. From Kimye to Kylieand Tyga, Rousteing’s crew felt like family, which was only strengthened with the arrival of models Joan Smalls,Jourdan Dunn, and Alessandra Ambrosio. And while the banquettes were filled with A-list fashion moments onBeyoncé and Solange, everyone took to the dance floor for what turned into an epic dance party.